Navigating cryptocurrency can be intimidating for the average person, requiring a familiarity with enigmatic terminology like “blockchain” and “mempool,” a willingness to ride out the volatility of the market, and a whole lot of faith. Alternately, you could just trust Steven Seagal. 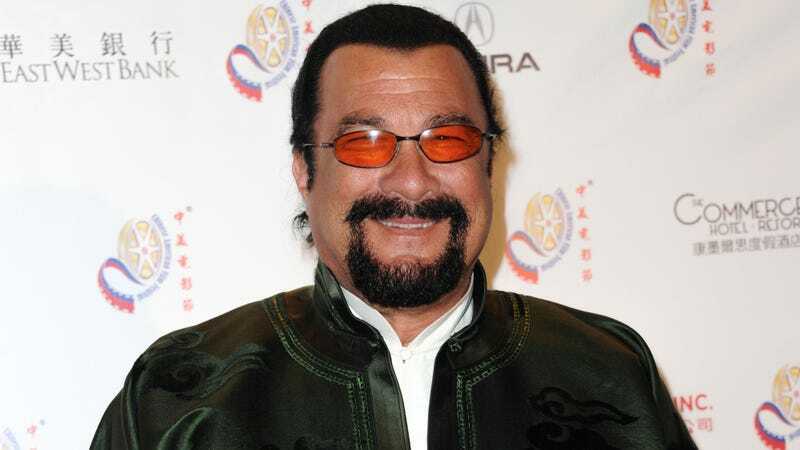 Seagal, the faded VHS tape at the back of America’s closet, is here to extend a reassuringly analog hand to jerk you roughly into the digital future, announcing his new role as the worldwide ambassador of “Bitcoiin 2nd Generation” on his official Twitter account. If you’ve been hesitating about entrusting your finances to the exciting, if somewhat ephemeral currency of tomorrow, now you can rest assured that it comes fully backed by Seagal, the notoriously discerning star of as few as six action films per year. The innovative, 21st-century populism and all-around 2nd Generation-ness of Bitcoiin begins with that additional “I”: After all, there is no “I” in “Bitcoin,” except for those two Is. But there are three “I”s in “Bitcoiin,” because, as the press release reminds, it is “Zen Master Steven Seagal” who has become its official brand ambassador. Breathe deeply and allow this B-movie Buddha to open your Third “I” to the boundless possibilities that can be unlocked once you achieve full enlightenment and ignore the fact that Bitcoiin’s white paper fails to explain specifically how it will provide a “superior or more advanced version” of Bitcoin—other than just utilizing the existing Ethereum blockchain, but with 100-percent more Steven Seagal. Or the fact that the plan behind Bitcoiin’s Initial Coin Offering—its “scheme,” if you will—is structured suspiciously like a pyramid. All of these doubts can simply be waved away, according to the press release. They are just so many fears that cloud your mind and weighing down the spirit. Unleash your inner dragon and sound your Biiiiitcoiiiiiiiin over the mountaintops of the world. Let go of these fears, then let Steven Seagal take charge of your financial future. And as the brand ambassador for Bitcoiin, Seagal—gushingly endorsed in the press release as “an intricate human being”—will be tasked with bringing that signature, intricately human warmth to educating investors that he does to reading dialogue, and making them feel as understood and considered as, say, a woman on his movie set. Cryptocurrency doesn’t have to be complicated. It can be as simple as just putting all your trust in Steven Seagal.